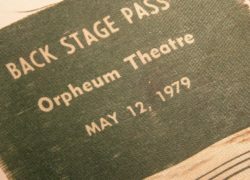 Item description: Back Stage Pass for the 12th May 1979 concert at the Orpheum Theatre, Los Angeles, USA. This was a part of Smith’s Wave Tour. Satin pass screen printed green on white. Condition report: Used condition and mounted to an old archive card. 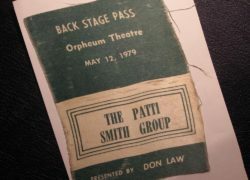 Background toThe Patti Smith Group: Smith had worked as a session artist throughout the 1960s, but, in 1974, Smith formed The Patti Smith Group. Initially with guitarist, bassist and rock archivist Lenny Kaye, and later with a full band comprising Kaye, Ivan Kral on guitar and bass, Jay Dee Daugherty on drums and Richard Sohl on piano. Ivan Kral was a refugee from Czechoslovakia, he moved to the USA in 1966 with his parents who were diplomats. After the Warsaw Pact invasion of Czechoslovakia in 1968, Kral decided not to return. The Patti Smith Group was signed by Clive Davis of Arista Records, and in 1975 recorded their first album, Horses, produced by John Cale amid some tension. The album fused punk rock and spoken poetry and begins with a cover of Van Morrison’s ‘Gloria’, and Smith’s opening words: “Jesus died for somebody’s sins but not mine” (an excerpt from “Oath”, one of her early poems). The austere cover photograph by Mapplethorpe has become one of rock’s classic images. As the popularity of punk rock grew, Patti Smith Group toured the United States and Europe. The rawer sound of the group’s second album, ‘Radio Ethiopia’, reflected this. Considerably less accessible than ‘Horses’, ‘Radio Ethiopia’ initially received poor reviews. However, several of its songs have stood the test of time, and Smith still performs them regularly in concert. She has said that ‘Radio Ethiopia’ was influenced by the band MC5. On January 23, 1977, while touring in support of Radio Ethiopia, Smith accidentally danced off a high stage in Tampa, Florida, and fell 15 feet into a concrete orchestra pit, breaking several neck vertebrae. The injury required a period of rest and an intensive round of physical therapy, during which time she was able to reassess, re-energize and reorganize her life. Patti Smith Group produced two further albums before the end of the 1970s. ‘Easter’ (1978) was her most commercially successful record, containing the single ‘Because the Night’ co-written with Bruce Springsteen. Wave (1979) was less successful, although the songs ‘Frederick’ and ‘Dancing Barefoot’ both received commercial airplay.